GLENDALE, Ariz. (AP) Although Franklin Gutierrez officially joined the Los Angeles Dodgers on Monday afternoon, the veteran outfielder had already been working out at their spring training complex for two days. The Dodgers reached a deal with him last week, but they couldn’t formally announce his arrival because they hadn’t been able to clear a spot for him on their 40-man roster until they traded veteran left-hander Vidal Nuno to Baltimore for a prospect on Sunday. Such is the nature of the Dodgers’ remarkable roster depth heading into a season of enormous expectations. The four-time defending NL West champions are bursting with quality big-leaguers at every position, ranging from seasoned veterans to blue-chip young talent, as they chase their first World Series title since 1988. The Dodgers’ extraordinary depth is a luxury for manager Dave Roberts, but it also means spring training is uncommonly important as they begin the difficult process of trimming this roster to a 25-man group. For instance, Roberts can choose among 10 legitimate big-league starters for his five-man rotation. The club also must make tough calls from the bullpen to the outfield, and the process takes another step forward Tuesday with the first full-squad workout. Since the deep-pocketed Guggenheim Baseball Management ownership group took over the team in 2012 and hired top baseball executive Andrew Friedman away from Tampa Bay two years later, the Dodgers have spent the bounty from their multibillion-dollar television deal with remarkable vigor. They did it again during this offseason, committing a combined $192 million to keep third baseman Justin Turner, closer Kenley Jansen and starter Rich Hill from the team that finished two wins shy of the World Series. The Dodgers also were deep last season, and they had to be: They won 91 games and reached the NL Championship Series despite setting a single-season major league record by putting 28 different players on the disabled list. They had seven starting pitchers on the DL at the same time in August, and they used 55 different players, tying a team record. 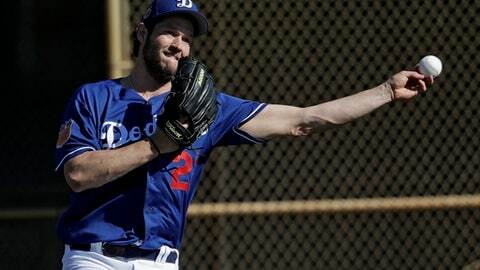 If injury problems ravage them again, the Dodgers think they will be ready. If the Dodgers stay healthy, they’ll just be loaded. The Dodgers entered spring training with a roster so deep that they couldn’t immediately announce the signing of Gutierrez or the return of Chase Utley. The well-liked veteran infielder is likely to play a utility role this season because Los Angeles already improved its infield by acquiring second baseman Logan Forsythe from Tampa Bay in a trade for pitching prospect Jose De Leon. The Dodgers confirmed Utley’s signing last week only after the departure of Darin Ruf, who could have been a contributor in several big-league outfields. Instead, he went to South Korea because he wasn’t likely to crack the Dodgers’ group. Los Angeles’ struggles against left-handed pitching last season were perhaps the only major blot on its resume, so the Dodgers went out and got Gutierrez, described by Roberts as ”a lefty killer.” Gutierrez is a career .289 hitter against lefties. The Dodgers didn’t hesitate to trade Nuno, a proven big-league reliever acquired in November, because they’re loaded with left-handed relief talent. Gutierrez was once a top prospect for the Dodgers, and he went to Los Angeles’ spring training in 2003 with Roberts, who was a Dodgers outfielder.